“The South”, Matana Roberts intones portentously at the beginning of “All Is Written”, the opening track of the third chapter (of a planned 12!) in her Coin Coin series. With just two words, said in a voice laced with gravitas, Roberts outlines exactly what is to follow: a visceral, foreboding and unflinching evocation of the hideous history, and complex legacy, of the American slave trade. It’s her most harrowing work to date in the series, and as such, where chapters two and three retained much of the jazz tradition she was previously associated with (perhaps erroneously), River Run Thee is a broiling, uncompromising work that rips down genre barriers altogether. Roberts’ saxophone still features prominently, of course, but it is one brush amongst many used to paint a vivid tapestry of the plight of so many people hauled in chains from Africa to states like Louisiana and Mississippi. Instead, Roberts turns to her voice, already a prominent feature on Chapters One and Two, but which is raised here to a Greek chorus that ties every strand of River Run Thee together. She alternates between mournful singing and looped and superimposed spoken texts sourced from the time she explores. Her voice is crystalline but laced with emotion, particularly on the ten minutes of ‘All Is Written’, on which she seems to encapsulate the feelings of so many in one phrase. “Why do we try so hard?” she moans, her voice cracking in the process. It’s a sentence that has echoed through centuries of civil rights struggles: why do we try so hard to make things better when the odds are stacked so resolutely against us? Why do we keep risking our lives to make a difference? Is the price worth paying? Of course, in the context of slavery, it takes on another meaning, questioning how it has come to pass that people have toiled away in backbreaking labour for the sole benefit of idle overlords. ‘All Is Written’ is nothing short of epic. Roberts’ imagery is vivid, and one can practically feel the beating southern sun and smell the swampy air as she evokes weeping willows and flashes of horrific violence, always present but alluded to rather than explicitly depicted, which is somehow all the more troubling. Throughout the album, the narratives glide across one another, taking the listener from a slave dhow in Zanzibar to a sun-baked plantation, touching on themes of religion, fate and justice, and the tracks duly bleed into one another, transforming River Run Thee into a symphonic collage on which wailing extended sax notes and lamenting voices raise themselves into the ether and seem to ask little more than “Why?”. Without a band to work with, Roberts turns to electronics to bolster her singing and saxophone, and the results make River Run Thee the most vividly potent of the Coin Coin series (so far). The last moments of ‘All Is Written’ dissolve into a carpet of oscillating drones, as if the myriad voices are being swallowed by the storms of time, only to re-emerge as a ritualised chant as the track segues into its follow-up, ‘The Good Book Says’, backed by gristly bursts of sound that one would more expect to hear on a noise album. Allowing the tracks to seep seamlessly into one another allows Roberts’ to build a grandiose vision with the most minimal of means, and even if each song tells its own story, the elliptical nature of these vignettes works best when approached as a whole, especially when Roberts sweeps background drones, voices (sampled and her own) and sax together as on ‘Always Say Your Name’ and ‘Nema, Nema, Nema’. Unlike the first two chapters, which dealt with more explicit stories delivered through more conventional musical structures, River Run Thee hones in on the tragedy and violence that lay at the core of the slave trade, coiled like murderous snakes. Matana Roberts’ music is similarly taut, bristling with angry textures and gasps of accusatory outbursts. Some of the samples even recall the most apocalyptic side of Constellation label-mates Godspeed You! Black Emperor, although Roberts’ music is more real, less portentous and ultimately more affecting. The album climaxes with the voice of Malcolm X as he attempts to deny accusations of racism, such a striking paradox that it projects Roberts’ portrayal of the African-American experience away from its painful past and into the unstable present. 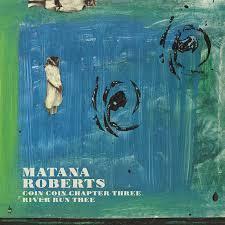 In light of recent events in Missouri, New York and elsewhere, no album you hear this year, or probably any other, will be as important and relevant as Matana Roberts’ Coin Coin Chapter Three: River Run Thee. This entry was posted in 2015, Music Reviews, The Quietus and tagged Avant-garde, Constellation Records, experimental, Jazz, Matana Roberts, music journalism, The Quietus. Bookmark the permalink.